Following the horrific shootings at Sandy Hook Elementary school in Connecticut last December, many called for strengthened controls on access to guns in the US. Most of us thought that even the NRA would now support sensible measures. However, the NRA then surprised us when, in a flamboyant press conference, NRA head Wayne LaPierre instead called for armed guards to be posted at all schools in the country. As I noted in a blog post at the time, there is no evidence that this would do any good, that placing more loaded weapons in the schools would indeed make more weapons available to shooters who made the guard one of their first victims, and that even if it were possible to place armed guards in all of the over 130,000 schools in the US, how would one also do this in all of the movie theaters, college campuses, shopping malls, fast food restaurants, churches, commuter trains, Christian prayer rallies, post offices, other work places, and all the other locations where mass shootings had been inflicted in the US in recent years. The mass shooting at the Washington Navy Yard on September 16 has now provided us a test of the NRA proposal. 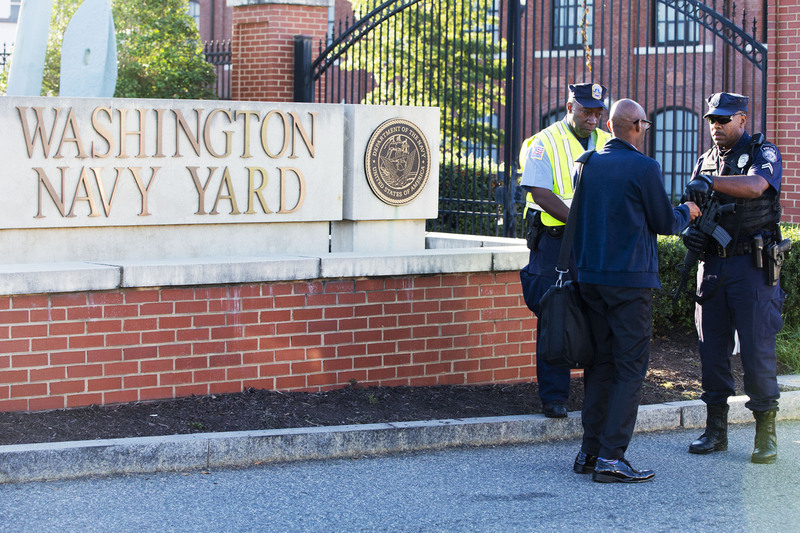 The Navy Yard is a military facility, with armed guards and secure entrances. The shooter, a former full-time Navy reservist, was now a private contractor working at the facility, and came in on morning of September 16 with a shotgun in a backpack. He had purchased the shotgun, legally, two days before at a gun store in Virginia not far from DC. He went to a bathroom on the fourth floor of the building, took out his gun, and started to shoot innocent people. At one point he shot an armed guard, took the guard’s weapon, and then used that weapon to shoot more people. Police arrived at the scene within two minutes of receiving notice of the shootings, and were inside the building within six minutes. The police, not the armed guards posted at the facility, eventually shot the killer. But 13 died, including the shooter. If armed guards at a military facility cannot stop such mass shootings, how can anyone believe that the NRA’s plan of armed guards in our schools will protect our school children?